We've been seeing a lot of these guys at night in the back lately. Ever since the kids crafted a bird feeder out of a milk carton, and a squirrel apparently tipped it over. Though it looks like daylight, this picture was actually taken around midnight. The light is entirely from my big flash (through the glass sliding door, no less). As the night went on, I figured ways to reduce the flash glare and increase the photo quality. The racoons frequently stopped and stared for a while in my direction trying to figure out what was going on, but the flash didn't seem to phase them much. 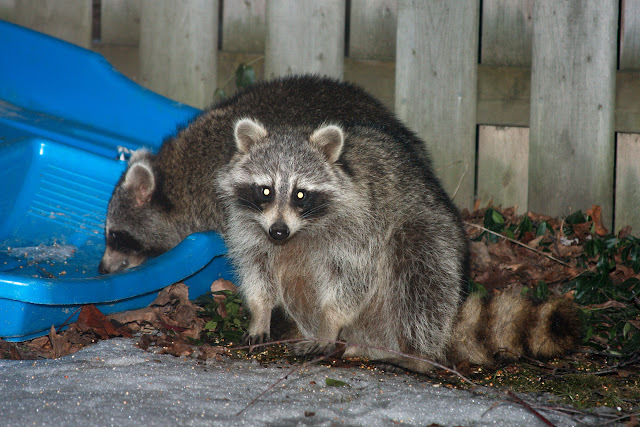 So way too many racoon-y pics are now just a click away!